The Eucharist is a meeting or assembly with Christ at his invitation. It sustains and reinforces the life in Christ begun in Baptism. 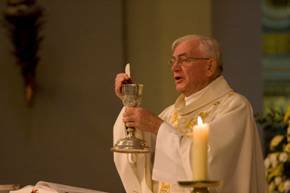 The Eucharist is our living out of Jesus’ exhortation “Do this in remembrance of me” It is a celebration of what we do in our daily lives – Christ’s life in us. In our Parish religious instruction in preparation for the sacrament of the Eucharist is organised through Parents’ Committees in the schools within the Parish. Teachers are employed to teach the Alive-O programme. The Parish Pastoral worker provides the link between parents, teachers and the Parish. In September 2008, the “Do this in memory” programme was introduced. The programme consists of special liturgy, for first Holy Communion children and their families, and it forms part of the family mass on 10 Sundays of the year. The Ministers of the Eucharist serve at the celebration of the Eucharist. They also bring Communion to the housebound and the sick on the behalf of the parish. “Redemptorist Publications” has a small book on the Eucharist which is helpful for children.